From the Kitchen: Shrimp and Crab Louis Salad | Stahancyk, Kent & Hook P.C. 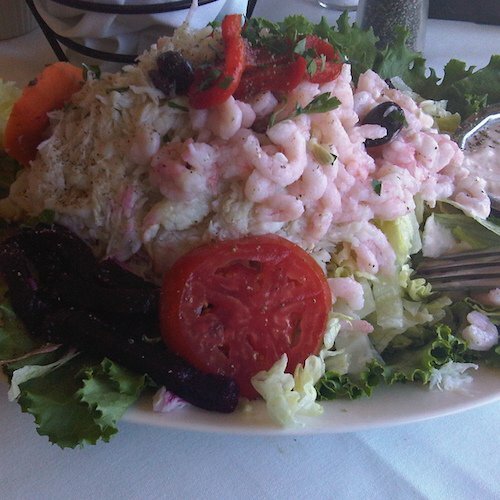 A Shrimp and Crab Louis Salad with plenty of seafood and fresh greens. Looking for a seasonal seafood salad? Look no further; here’s a recipe for a delightful and versatile California dish. Feel free to try it with all crab or all shrimp! Place eggs in a saucepan and cover with cold water. Bring water to a boil; cover, remove from heat and let eggs stand in hot water for 10 to 12 minutes. Remove from hot water and let cool. Then peel and chop. Evenly divide the lettuce, cucumbers, crab, shrimp, avocado, tomatoes and eggs between four salad plates. Prepare the dressing by whisking together the mayonnaise, chili sauce, relish, and salt and pepper in a large mixing bowl. Spoon dressing over the salad and garnish with parsley and lemon.